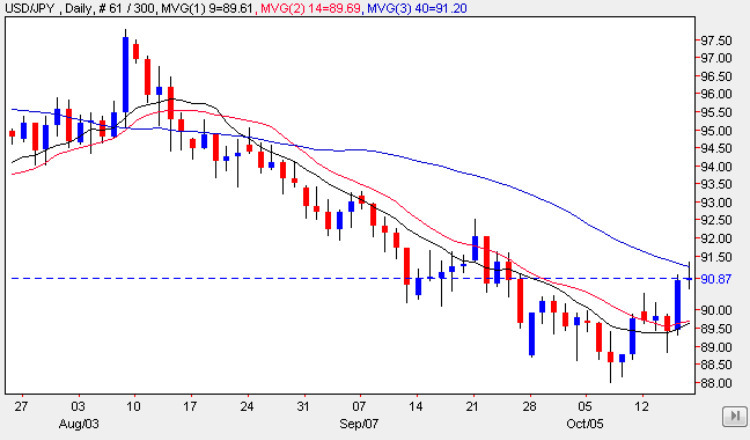 The temporary move higher for the yen to dollar currency pair which was partly due to Japanese exporters settling accounts which they tend to do on the 5th, 15th and 25th of each month appears to have run out of steam, with Friday’s candle ending the trading session and the week with a doji cross candle, indicative of indecision in the market, and therefore indicating a possible turning point. This analysis is further reinforced by the fact that the high of the day seemed to find resistance from the 9 day moving average which is directly above, suggesting that we should see a reversal back lower in the short term, with a resumption of the bearish trend lower in due course. In addition, the 90.87 price handle is deep in a minor resistance area which again provided a barrier to a move higher on Friday and in summary we can expect to see prices continue lower once the reversal has been confirmed. With little significant news on the economic calendar for either Japan or the US aside from the Tertiary Industry Activity in Japan which came in at 0.3% indicating that service demand in Japan had risen for three months in a row, and a speech from Ben Bernanke (see euro vs dollar site for details) today will be a day for technical trading. You can keep up to date with all the latest fundamental news on the economic calendar, latest currency news and live currency charts by simply following the links. I have also included details on an excellent ECN broker.